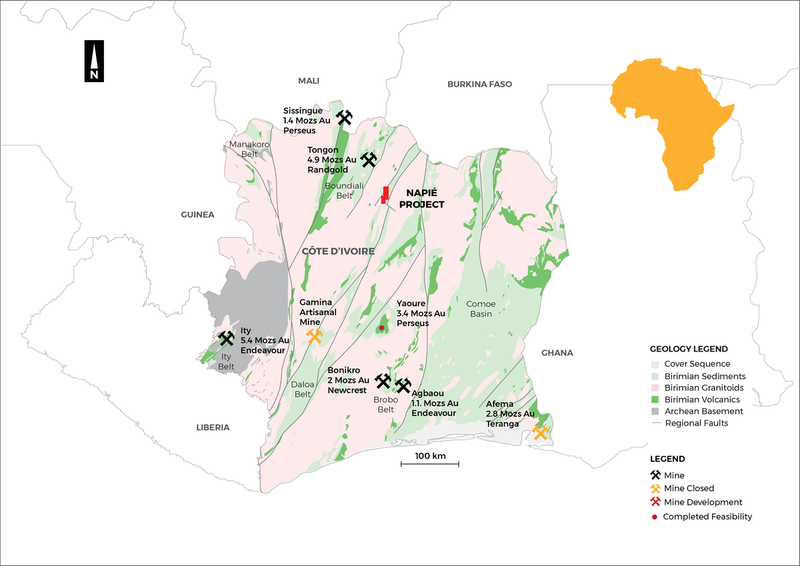 Mako Gold's Napié Project is located in the north central part of Côte d’Ivoire (Figure 1). It is 30km southeast of the city of Korhogo and it is easily accessed by a good road system. Mako is earning up to a 75% interest in the Napié Project under a farm-in and joint venture agreement with Occidental Gold SARL, a subsidiary of West African gold miner Perseus Mining Limited (ASX/TSX: PRU). Multiple gold trends, extending over an aggregate total of 29kms, have been defined by soil/auger anomalies and RAB drilling. Mako Gold completed a maiden drilling program on 17 July 2018. The program consisted of 52 Reverse Circulation (RC) holes for a total of 4,171m drilled and 6 diamond core (DD) holes for a total of 609m drilled. 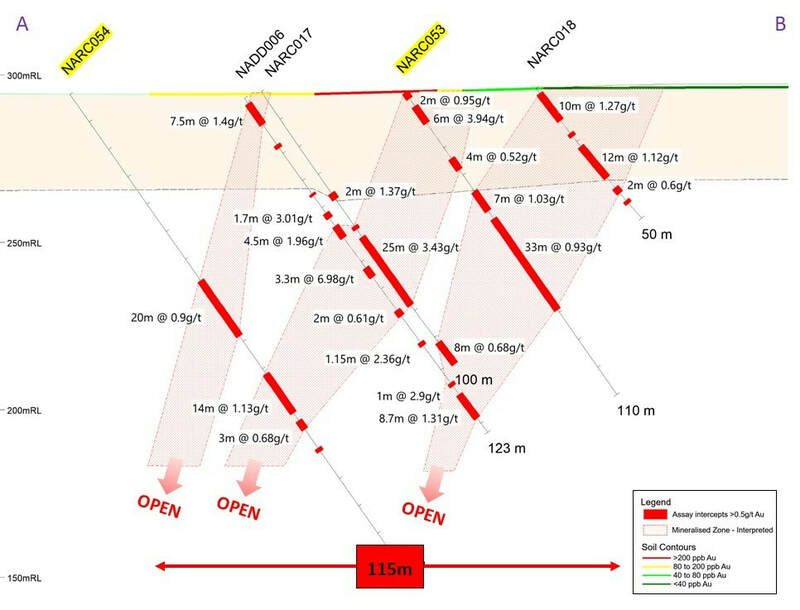 Wide-spaced drilling outlined a 13km long gold corridor including the 5km Tchaga Prospect and 4km Gogbala Prospect (Figure 2). Significant gold mineralisation encountered during this program included 3.43g/t Au over 25m and 6.98g/t Au over 3.3m at the Tchaga Prospect and 5.39g/t Au over 12m and 2.67g/t Au over 6m at the Gogbala Prospect. As a follow up to this program, in January/February 2019, a further 2,550m of RC drilling was completed in 17 holes at the Tchaga and Gogbala Prospects. The gold results returned from drilling confirm that there are multiple, wide, parallel gold mineralised zones. Mako has now intersected these wide mineralized zones along significant strike lengths up to 2km parallel to the trend of the regional shear zone. This increases Mako's confidence in the potential for the Napié Project to host large high-grade gold deposits. 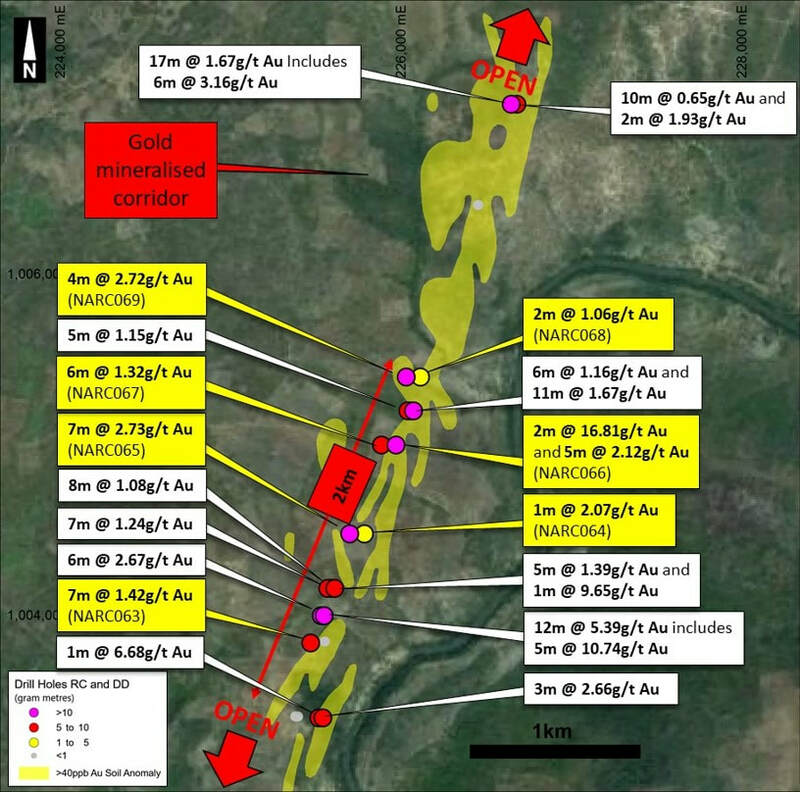 Drilling within the Tchaga Prospect (Figure 3) intersected significant widths and grades of gold mineralisation (Figure 3). Some of the significant drill intersections include 28m at 4.86g/t Au from 83m (NARC057), 25m at 3.43g/t Au from 53m in NARC017, and 17m at 2.43g/t Au from 86m in NARC055. See Figure 3 for all significant assay results. 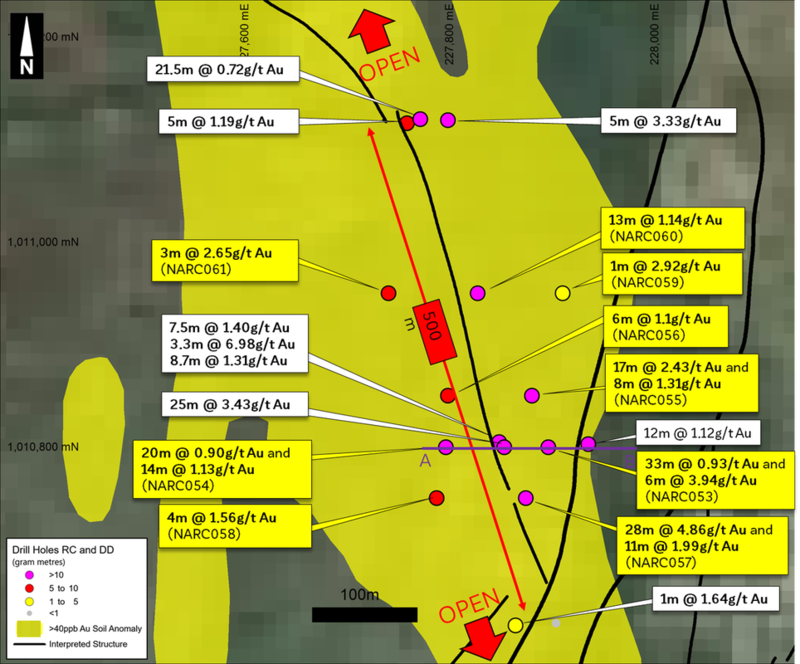 The mineralised strike length at Tchaga Prospect has been confirmed to 500m (Figure 3). ​Widths of intermittent gold mineralisation in drilling thus far reach up to 115m laterally as shown in the cross section (Figure 4). ​Mineralisation remains open in all directions. RC drilling within the Gogbala Prospect (Figure 5) intersected significant widths and grades of gold mineralisation with individual assays up to 29.89g/t Au (NARC066), and separately, widths up to 17m. Significant drill intersections from the Gogbala Prospect include 12m at 5.39g/t Au from 11m, including 5m at 10.74g/t Au in NARC035 and 7m at 2.73g/t Au from 77m in NARC065. See Figure 5 for all significant assay results. The mineralised strike length at Gogbala Prospect has been confirmed to 2km (Figure 5). ​Mineralisation remains open in all directions. The areas drilled to date area cover only a very small part of the 23km long main +40ppb soil/auger anomaly (Figure 2). Gold mineralisation is open laterally, along strike and at depth on both prospects. Mako is planning a follow-up drill program on the Tchaga and Gogbala Prospects prior to the start of the wet season, which usually begins in July. ​The untested portions of the soil/auger anomalies (Figure 2) will be a target for future exploration after the priority Tchaga and Gogbala Prospects have been advanced.